The Gettysburg Harrsburg Railroad crosses the Pickett’s Charge fields on the way to Little Round Top and Round Top Park. This view was taken from Seminary Ridge, possibly on the roof of the McMillan House during the 1913 reunion. This photograph is courtesy of Rich Kohr. This view was taken facing east circa June/July, 1913. 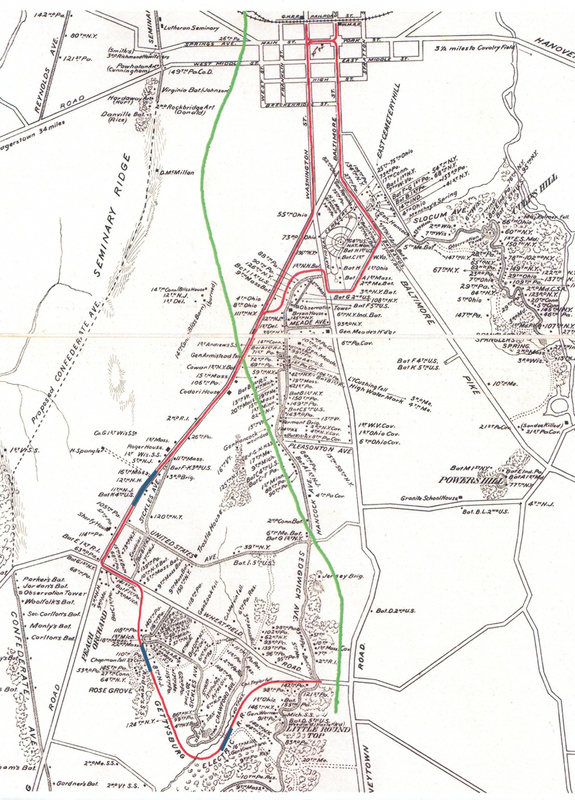 In our first post, Don Walters introduced us to the Gettysburg Harrisburg Railroad. 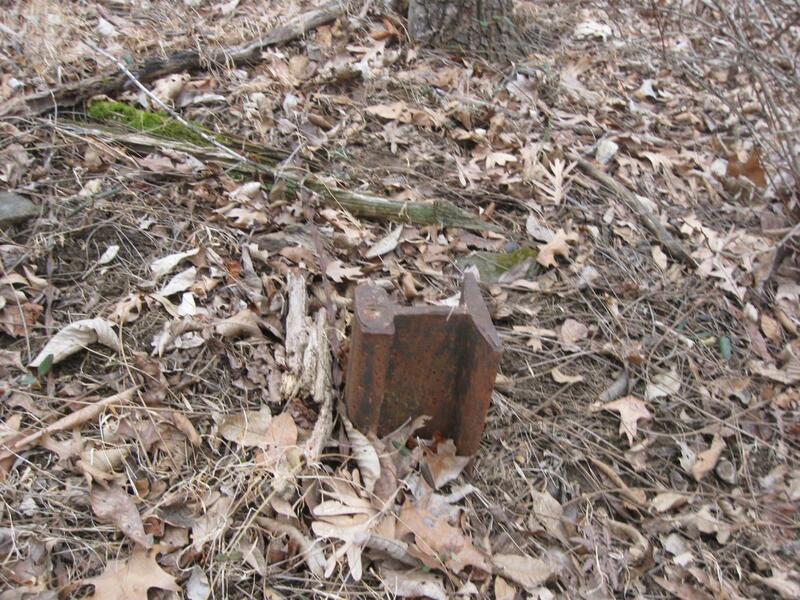 In our second post, we viewed some visible parts of the railroad ties in the Borough of Gettysburg. 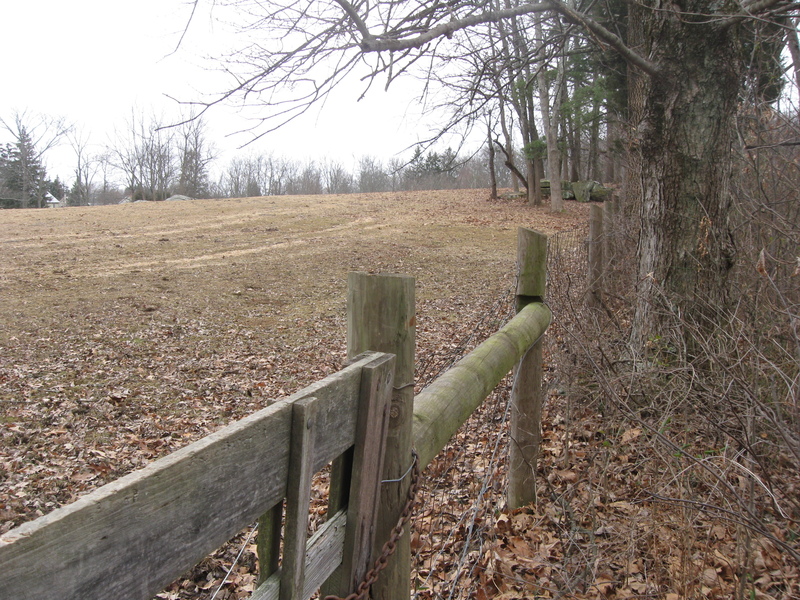 In our third post, Don took the railroad across the fields of Pickett’s Charge. 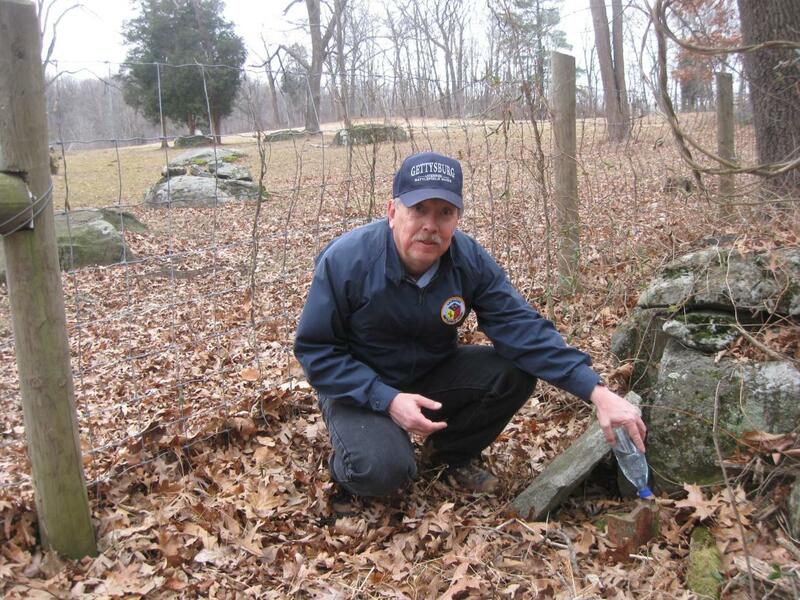 In our fourth post, Don took the Gettysburg Harrisburg Railroad across Hancock Avenue, and into the woods east of Weikert Hill on which sits the First New Jersey Brigade Monument. 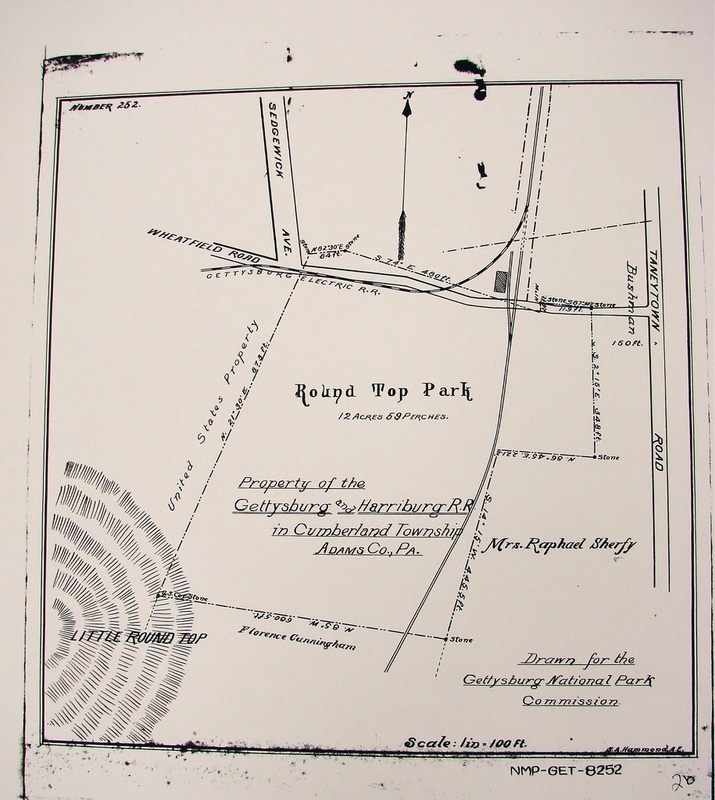 In today’s post, we finish our Gettysburg Harrisburg Railroad tour at Round Top Park. 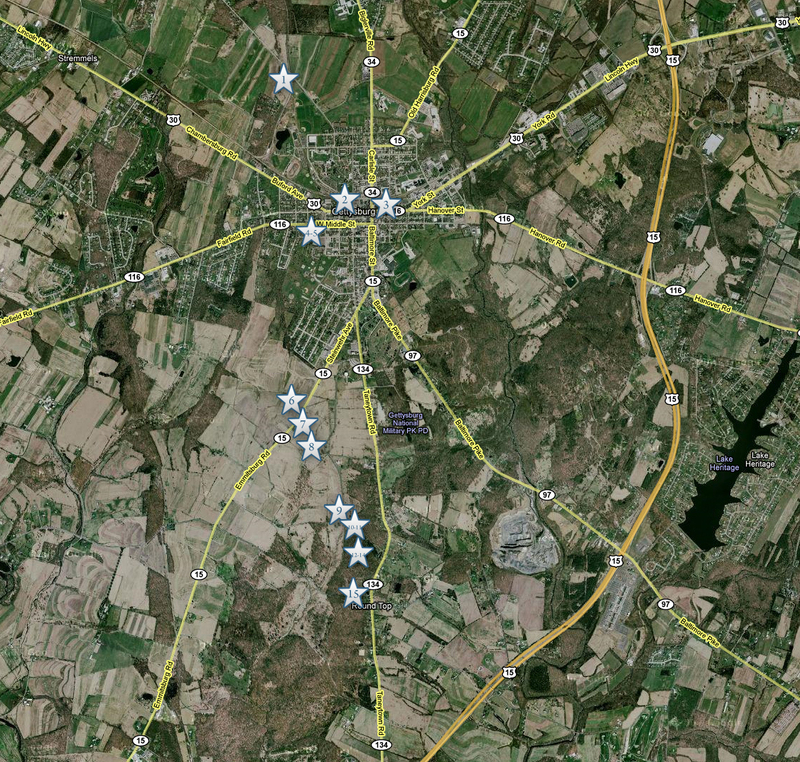 This map shows the locations of the videos that were created for these posts. Video #1 was taken at the Oak Ridge observation tower. Video #2 was taken at the Gettysburg Harrisburg Railroad station on North Washington Street. Video #3 was taken inside the Western Maryland Railroad station on Carlisle Street. Videos #4 and #5 were taken at Codori Memorials on Middle Street. Video #6 was taken in the Pickett’s Charge fields west of the Emmitsburg Road. 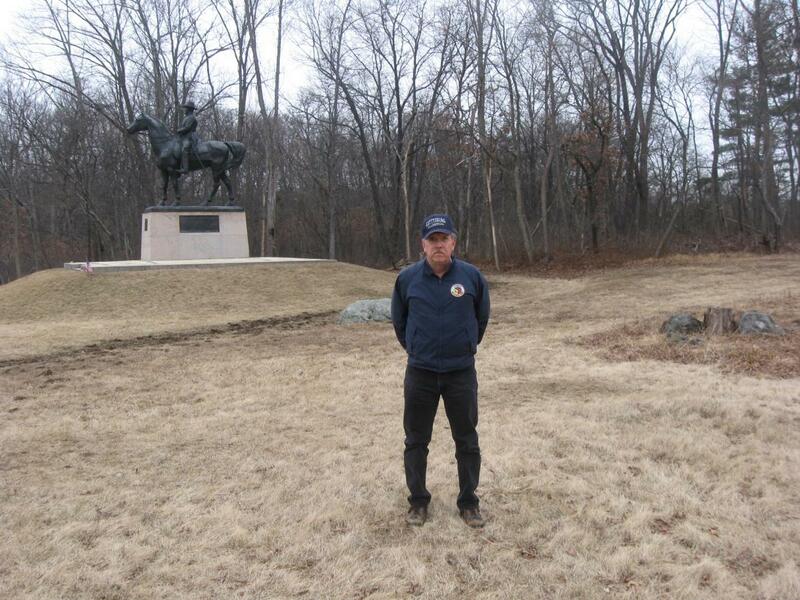 Video #7 was taken near the monument to Colonel George Ward of the 15th Massachusetts Infantry regiment east of the Emmitsburg Road. Video #8 was taken near the Hancock Wounding Marker west of Hancock Avenue. 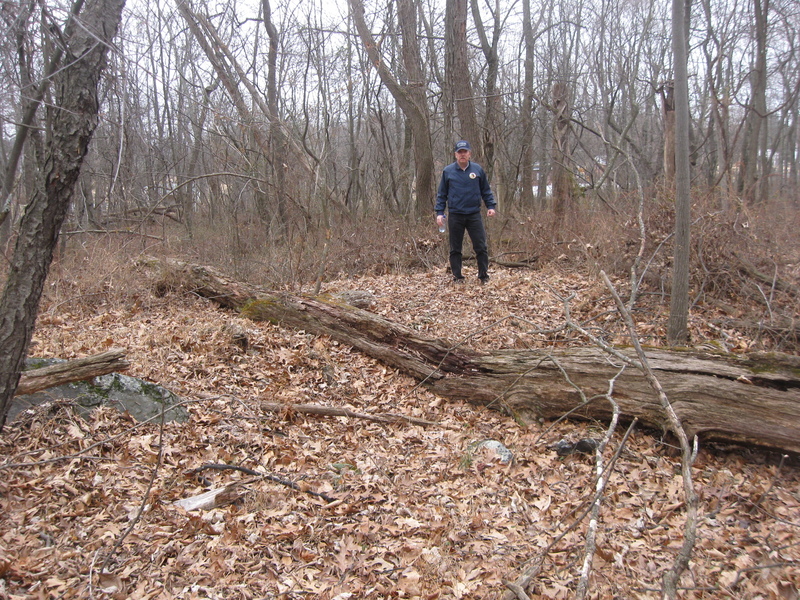 Video #9 was taken near the monument to Dow’s Maine Battery on Hancock Avenue. Video #10 was on the west side of Weikert Hill and #11 was taken east of Weikert Hill. Videos #12-14 were taken in the woods behind (east of) the Sedgwick equestrian monument. Video #15 was taken on the Wheatfield Road near Round Top Park. 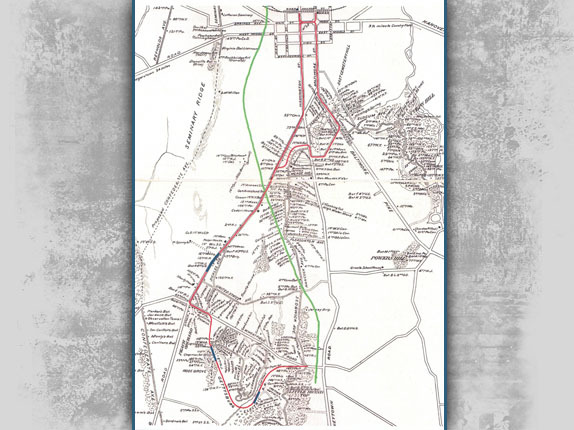 This map was created facing north at approximately 6:00 PM on Monday, April 27, 2009. Gettysburg Licensed Battlefield Guide Don Walters is our host for this series on the Gettysburg Harrisburg Railroad. Here he is standing near the Sedgwick equestrian monument on Sedgwick Avenue. We will momentarily enter the woods behind the monument. This view was taken facing northeast at approximately 3:00 PM on Sunday, February 22, 2009. In Video #12, Don Walters explains that we will enter a trail behind the Sedgwick monument in order to avoid the underbrush. This view was taken facing northeast at approximately 3:00 PM on Sunday, February 22, 2009. Don has walked in approximately fifty yards on the trail behind the Sedgwick monument… This view was taken facing northeast at approximately 3:00 PM on Sunday, February 22, 2009. 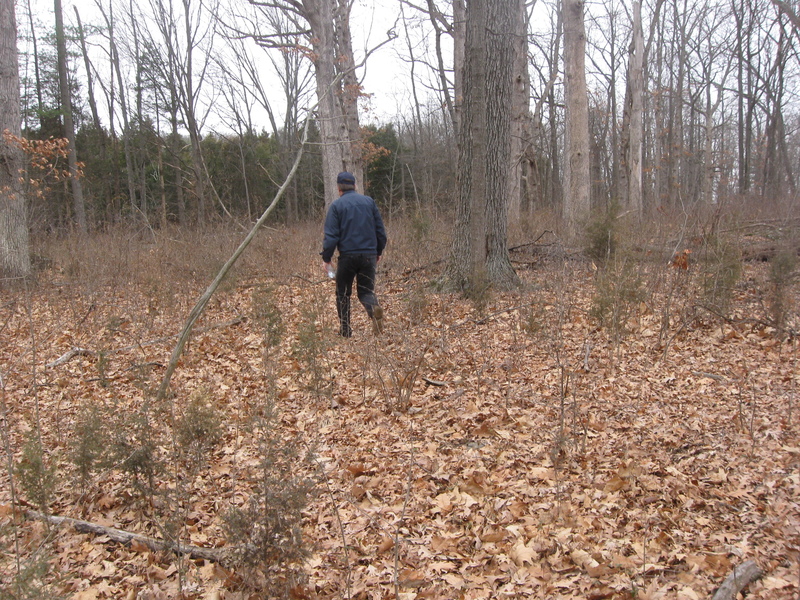 …He’s now going to take us off the trail to the east. This view was taken facing northeast at approximately 3:00 PM on Sunday, February 22, 2009. He is way ahead of us at this point… This view was taken facing east at approximately 3:00 PM on Sunday, February 22, 2009. 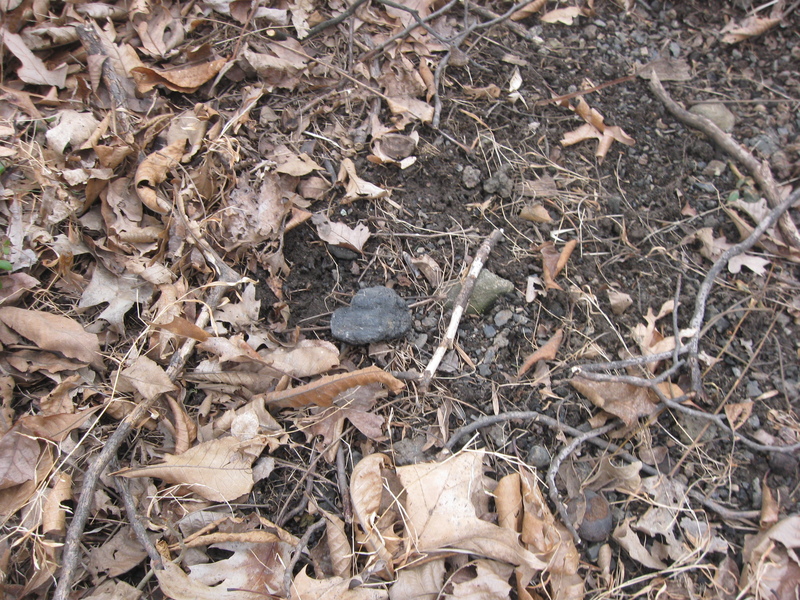 …until he found the base of a railroad/informational sign. This view was taken facing north at approximately 3:00 PM on Sunday, February 22, 2009. A closeup of the railroad/informational sign. This view was taken facing north at approximately 3:00 PM on Sunday, February 22, 2009. 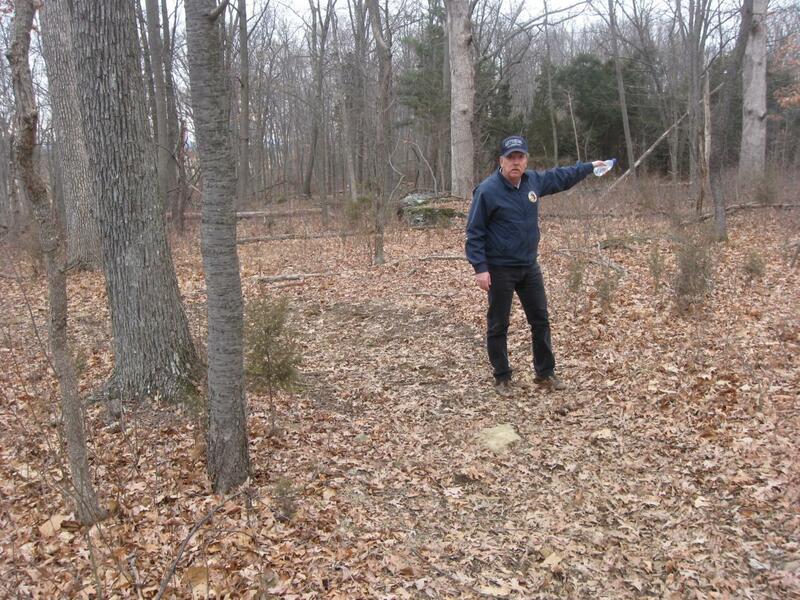 In Video #13 Don Walters shows us some possible earthworks, the base of the directional/information sign, the railroad bed, and a “clinker.” Although Don said our next stop would be at Round Top Park, we have one more stop before we get there. This video was taken facing north to east at approximately 3:00 PM on Sunday, February 22, 2009. A close-up of the clinker that Don showed us in Video #13. This view was taken facing southeast at approximately 3:00 PM on Sunday, February 22, 2009. 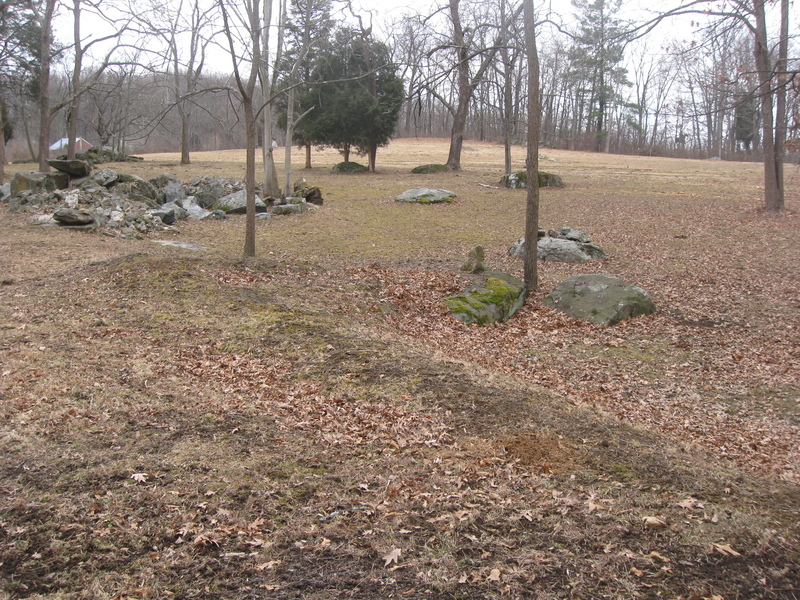 As we have moved farther to the south, the road bed became very prominent. Here is the east side… This view was taken facing east at approximately 3:00 PM on Sunday, February 22, 2009. …and here is a view from the west side. In this area the road bed is approximately eight feet tall. This view was taken facing west at approximately 3:00 PM on Sunday, February 22, 2009. 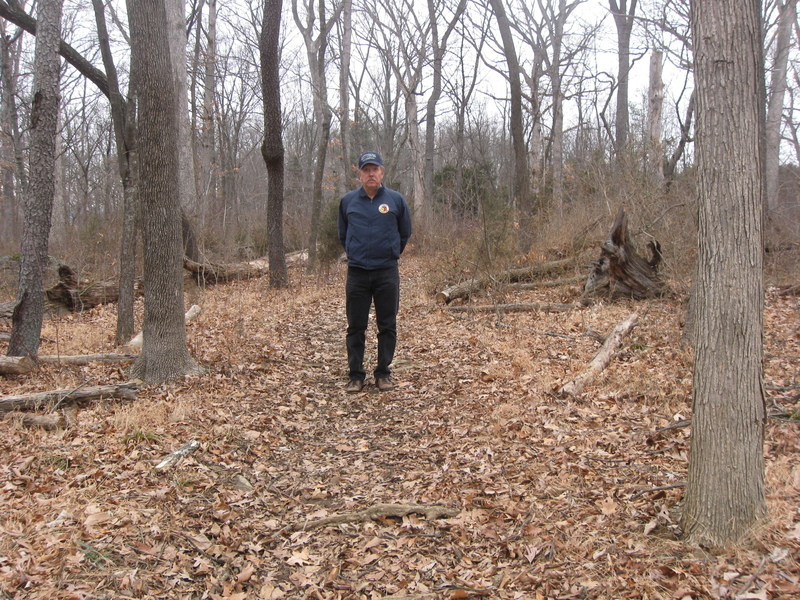 In Video #14 Don walks to the top of grading and shows us how the tracks cut through National Park Service land currently leased by a private individual. This view is taken facing west to south at approximately 3:00 PM on Sunday, February 22, 2009. Since we are here, we thought we would point out that we are standing in the railroad bed looking across National Park Service land leased by a private individual for $75 a year. This view was taken facing south at approximately 3:00 PM on Sunday, February 22, 2009. We are standing in the same spot as the previous photograph. The private individual renting this land is the wife of the current superintendent of Gettysburg National Military Park. 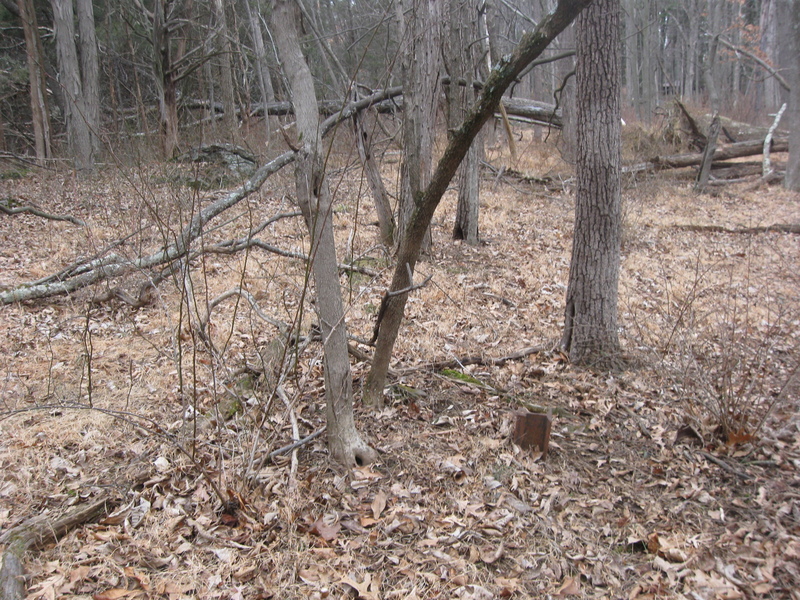 The cleared land in this photograph is covered under the lease agreement. This view was taken facing southwest at approximately 3:00 PM on Sunday, February 22, 2009. 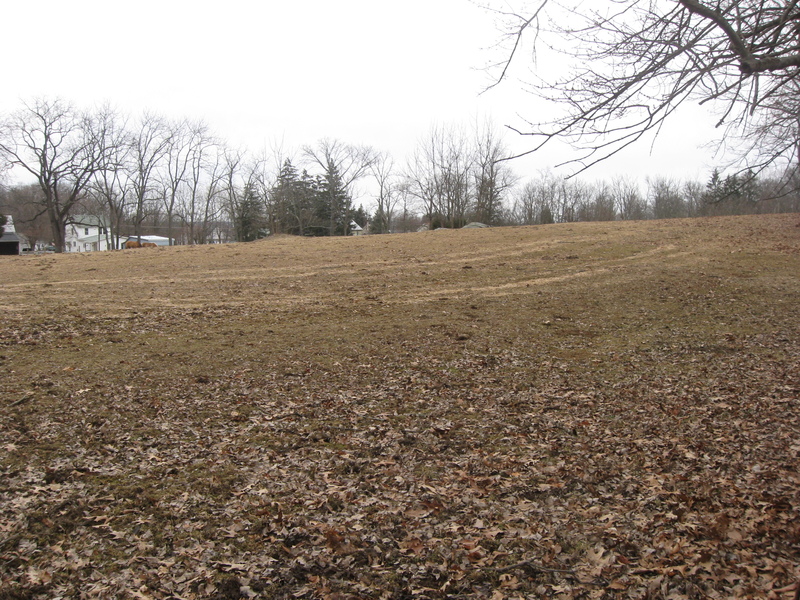 Here is another view of the leased area from the west side of the property. This view was taken facing southeast at approximately 3:00 PM on Sunday, February 22, 2009. Don is bending over the base of another railroad directional/informational sign. Behind him is a controversial fence that has made the news recently. 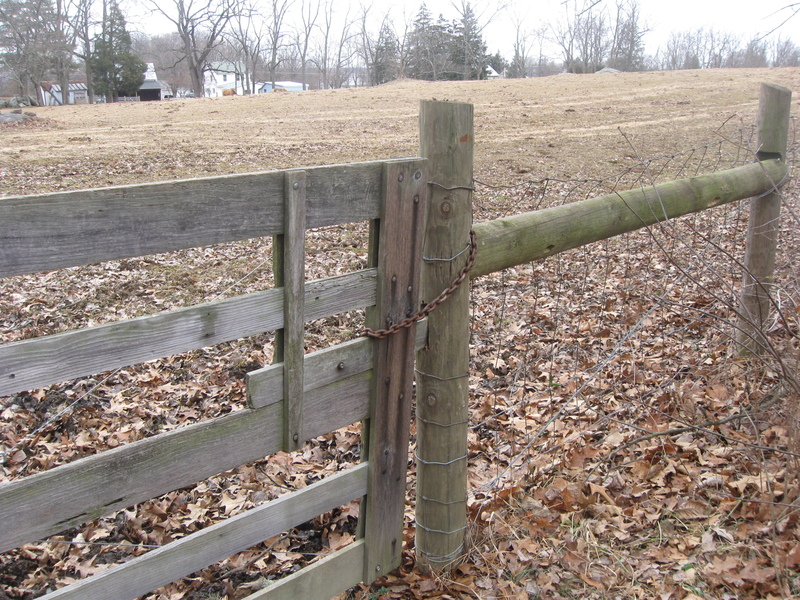 We don’t agree with most of the items discussed in the article, but the lease and the fence concerns us. 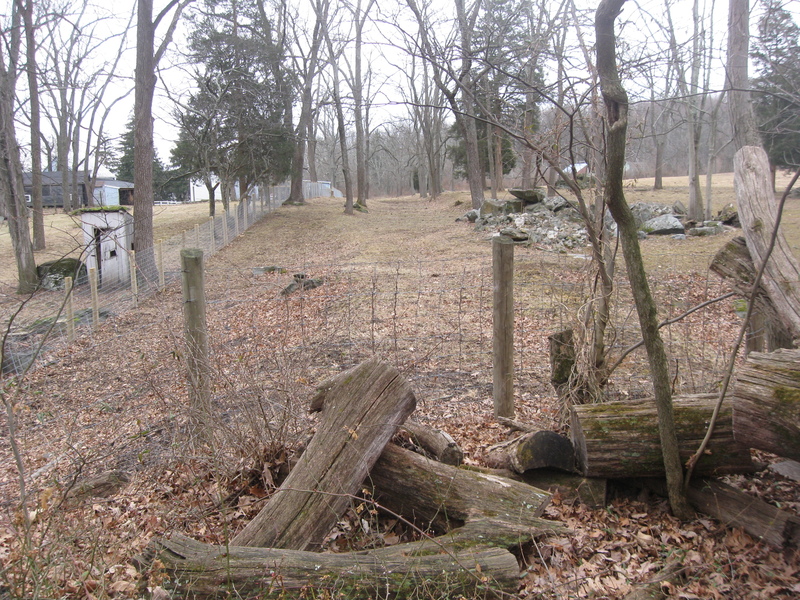 The construction and replacement of the fence cost over $8700, which was billed to Eastern National Park and Monument Association, the non-profit organization which used the run the bookstore at Gettysburg National Military Park. For full disclosure, your editor worked 17 years for Eastern National and was very proud of the millions of dollars we gave the National Park Service interpretive/educational programs. The Eastern National donation funds which parks received were disbursed by the parks’ superintendents and were to be used to meet the educational and interpretive needs of the National Park Service. This view was taken facing southwest at approximately 3:00 PM on Sunday, February 22, 2009. The mission of Eastern National is three-sided. It serves as a “educational institution that functions as a part of the interpretive, or educational arm of the National Park Service.” It acts as “a business that acquires or produces and sells cultural material to enhance the enjoyment of visitors to the national park system.” And finally, it is “a philanthropic organization that disperses net profit directly (and indirectly) to the National Park Service for a wide-range of diverse programs, such as educational programs; teacher’s workshops; park newsletters, audio/video tours; visitor center films; special events; living history programs and more.” This view was taken facing southeast at approximately 3:00 PM on Sunday, February 22, 2009. We like the superintendent and the work he has performed at Gettysburg National Military Park, but it is difficult for us to see how the construction of this fence supports the mission of Eastern National Park and Monument Association (Eastern National) or the educational and interpretive programs of the National Park Service. This view was taken facing southeast at approximately 3:00 PM on Sunday, February 22, 2009. 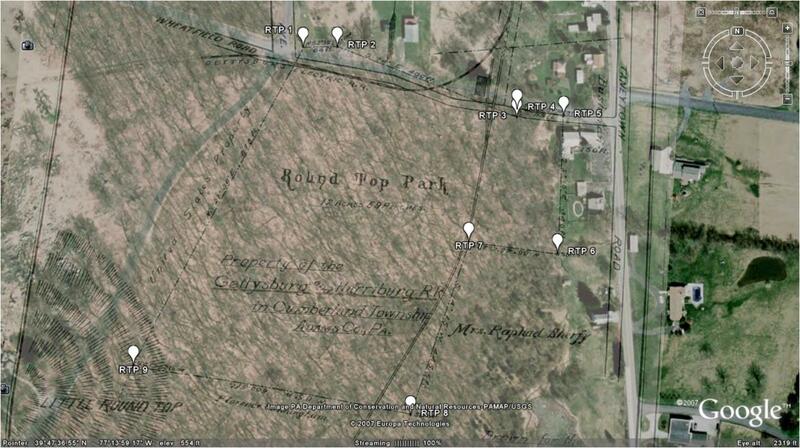 We have now reached the area of Round Top Park. 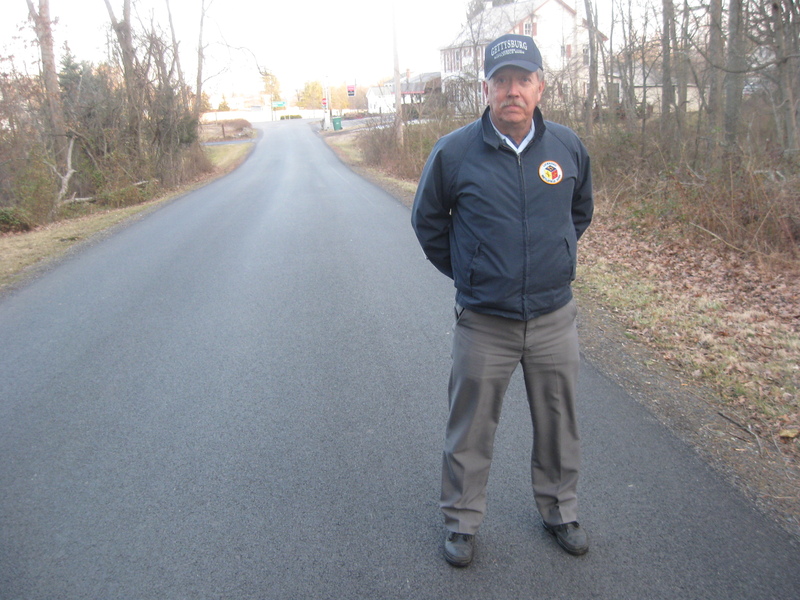 Don is standing where the tracks cross the Wheatfield Road. 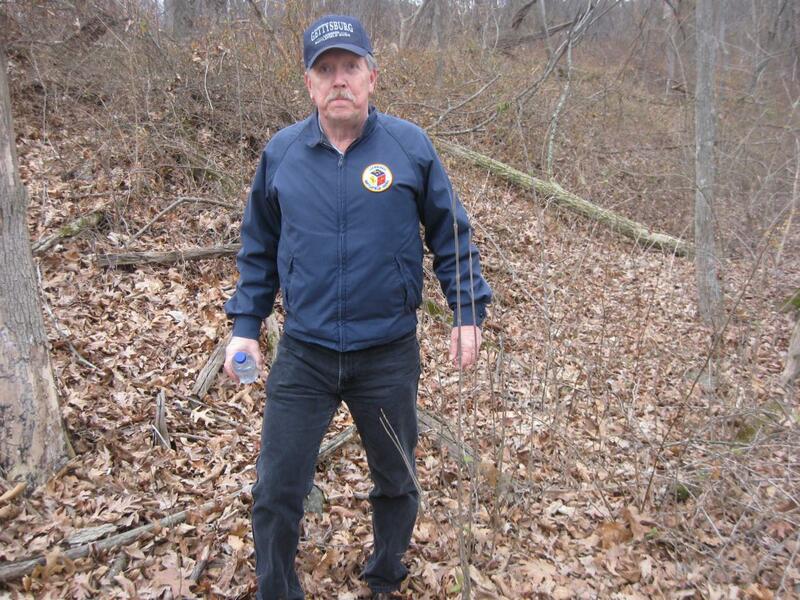 The Taneytown Road is behind him at the bottom of the slope. This view was taken facing east at approximately 3:00 PM on Sunday, February 22, 2009. 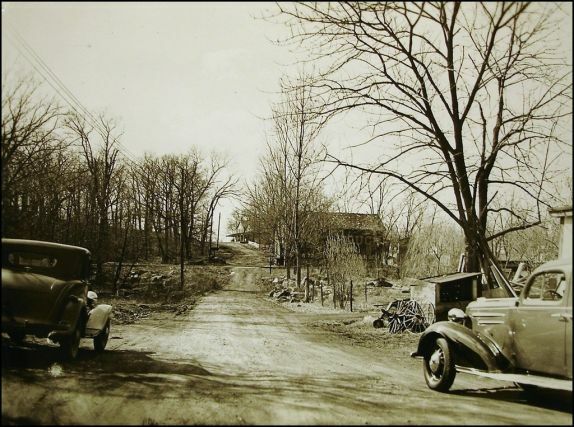 This photograph is taken from the Taneytown Road, looking up the Wheatfield Road. Notice the tracks crossing the road in the middle of the photograph. Don was standing in the vicinity of the tracks in the previous picture. This view was taken west in the 1930s. In Video #15 Don shows us how the tracks entered Round Top Park and how the trains would have turned around to go back into town. This view is taken facing all cardinal directions at approximately 3:00 PM on February 15, 2009. 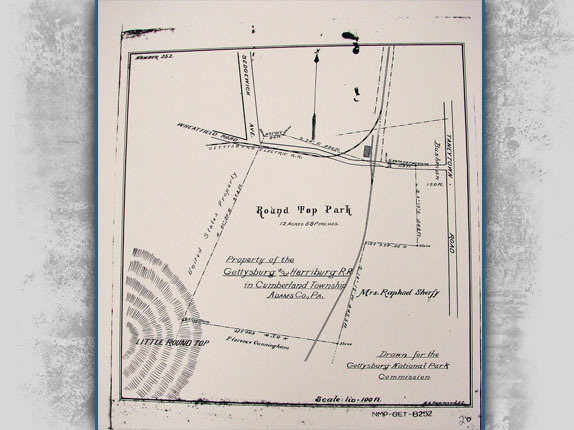 This map was created by the Gettysburg National Military Park Commission in the early 1900s. 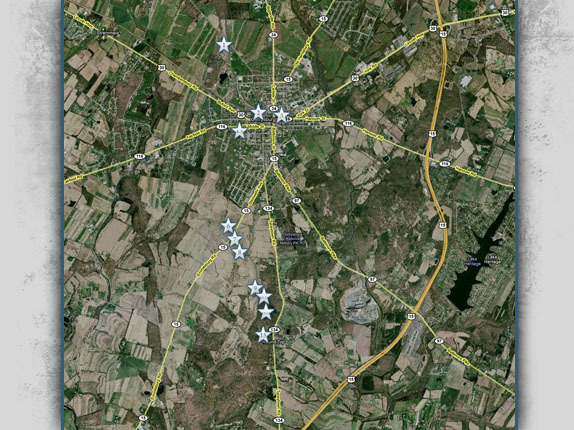 Here is a satellite map with the Commission map overlayed.